If you own Asus Zenfone 3 (ZE552KL), please do leave your feedback too. The ASUS Zenfone 2 has been a successful product lineup for the Taiwanese company, by providing a good feature set at a competitive price tag. After launching countless variations of the Zenfone 2, in 2016 ASUS has finally upgraded the lineup to Zenfone 3. First and foremost comes a complete design change, now with a glass and metal construction that is reminiscent of Samsung’s Galaxy S7 and available in four vivid color options. The phone is thinner than its predecessor, now measuring at 7.7mm and less too at 155 grams. The screen measures in the same at 5.2-inches with a 1920 x 1080 pixel resolution, resulting in a crisp 424PPI pixel density. The screen is covered with Gorilla Glass protection that’s gently slopes towards the corners. Considering Intel’s exit from making chips for mobile devices, the Zenfone 3 now sports a Qualcomm Snapdragon 625, an octa-core chip with all cores clocked at 2GHz. Coupled with it is either 3GB of RAM and 32GB internal storage, or 4GB RAM and 64GB, depending on the model. You also get a microSD card slot to up it even further. Speaking of the cameras, the rear module is a 16 megapixel sensor with fast laser autofocus and Optical Image Stabilization (OIS) to capture less shaky video and better low light photos. It boasts of features such as real-time HDR, continuous autofocus with subject tracking and a sapphire crystal protection for the lens. The front selfie camera has an 8MP resolution. Other features include a fingerprint scanner at the back, that has become one of the most convenient features to have in any phone today. There’s a USB Type C port at the bottom, that accepts cables plugged in either of the two sides. A large 2650mAh battery powers the Zenfone 3, hopefully adequately for most people. This dual-SIM phone phone accepts a micro SIM and a nano SIM but the second slot is hybrid. Lastly, the phone runs Android 6.0 Marshmallow out of the box with ASUS’s ZenUI 3.0 overlay. 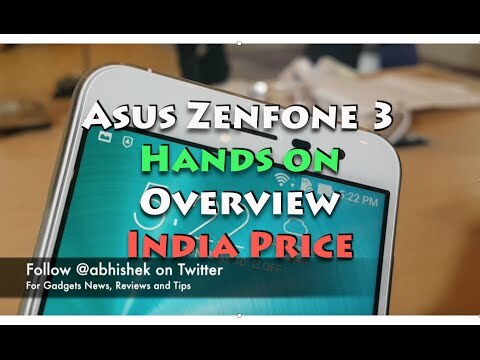 The Zenfone 3 looks like a well-rounded package that hopefully ASUS will again aggressively price, as the people have come to expect of Zenfones now. Alternatively, you could check out the LeEco Le 2 or the Yu Yunicorn.